I’m a sucker for good design. What can I say? I love products that are functional, obviously, but if they can also serve up a good dose of form, I’m sold. Many baby products are heavy on function, but leave a lot to be desired in the design department. This is why I love Urbini. We having been using their Omni travel system since Juliza was an infant, and we still use the stroller to corral her on outings that will involve a lot of walking — or a lot of shopping. 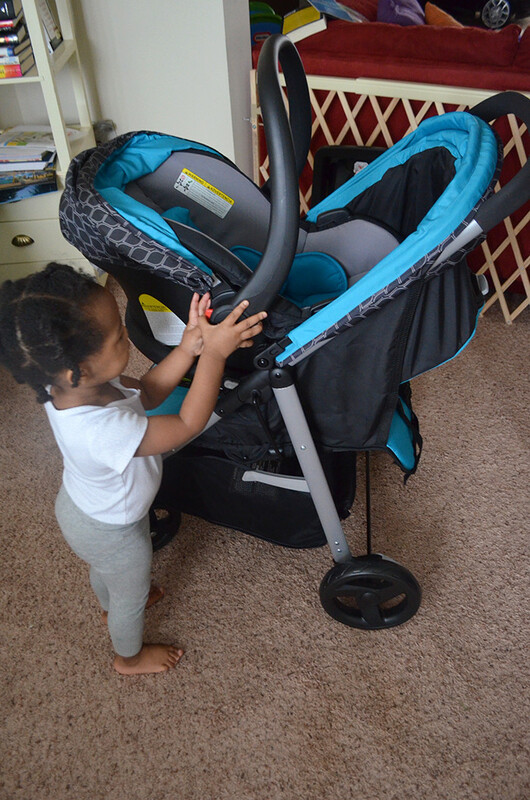 So when Walmart asked me to review the Urbini Turni travel system, I was excited to give another one of their products a try. The Turni system includes a Sonti infant car seat with a base, and a full-size stroller. Juliza is too big to sit comfortably in the car seat these days, but she was happy to pretend for the camera. You can see that her head is right at the top of the car seat because she’s so tall. Anyway, there are some features of the car seat that I really like. First, the base is easy to install with a seat belt or the LATCH belt system. It literally took a minute to get it strapped into our van. 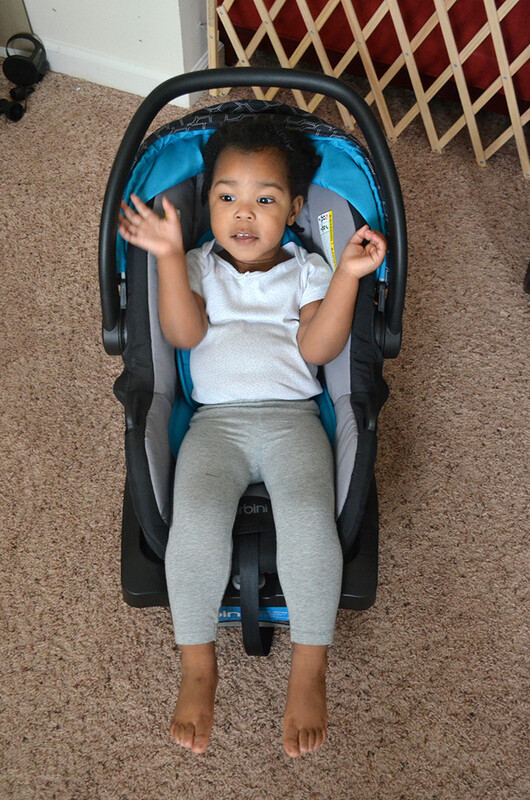 Compared to the pulling and tugging I had to do to install Juliza’s current convertible car seat, it was a breeze. And the car seat snaps in easily and slides out with the pull of a handle. The seat itself is well padded and offers adjustable straps that can move as baby grows. It can accommodate baby up to 35 lbs. While Juliza hasn’t reached the weight limit yet, her height means that she’s definitely more comfortable in a bigger seat. As such, the stroller is what I was really looking forward to trying. Our previous Omni system had a unique setup. 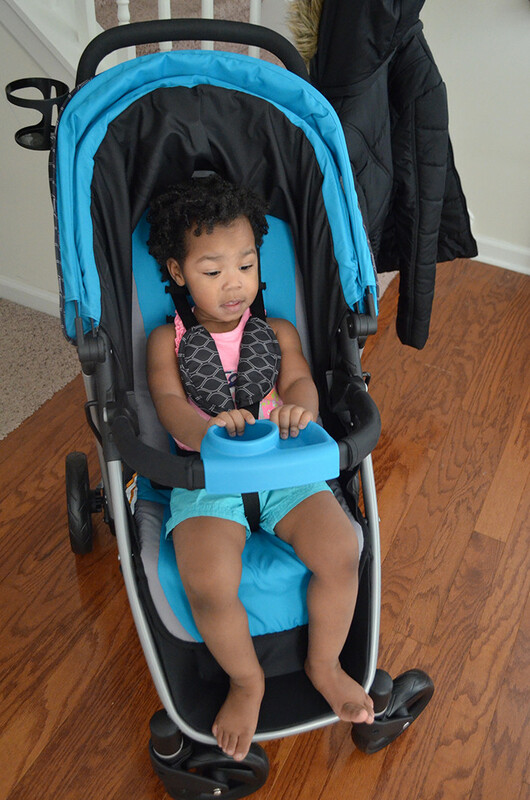 The car seat and stroller seat snap into a free-standing frame separately. 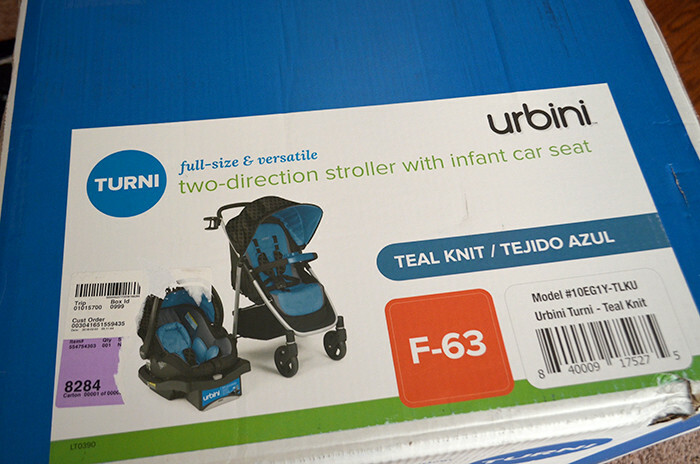 The Turni has a more traditional configuration, with the car seat, sans base, designed to sit on top of the stroller. Speaking of the stroller — I was not anticipating having to put it together. It came out of the box in several pieces, with the wheels and seat bar requiring installation. For the front wheels, that was really easy. They just snapped into place. The rear wheels were a bigger challenge, though. One wheel came attached to the axle with a place to attach the second. To do that, I had to first remove a washer and “hairpin” in place on the empty end of the axle, slip the wheel on, then replace the washer and hairpin. Removing the hairpin was a challenge, requiring a bit of elbow grease and coordination, but slipping the wheel and washer onto the axle was easy enough. The biggest problem, though, was replacing the hairpin. I fought with it for 15 minutes easy, and it slipped out of my hands a few times and flew across the room. Which meant I had to spend another 10 minutes on my hands and knees on the carpet trying to find it. Finally, I slipped a flathead screwdriver through the middle to open it a bit before putting it on. That helped just enough to let me slide it into place grudgingly. I almost gave up, and my thumb was sore for a full day afterward from trying to install it. Not fun, and I hope that there’s a way to make this easier in the future. Once it was finally in place though, attaching the rear axle to the stroller was simple. All of that aside, I really like this stroller. My little one can sit forward- or rear-facing, and making that switch is really easy. I just have to push a button at the top of the seat and slide it into the position I want. I LOVE this feature! No. Really. The reversible shade can work either way, and it is huge with a ton of coverage. Juliza was only too happy to try the new stroller, but she was a teensy tiny bit (read: very, very) mad that I took her out to try the rear-facing position. In spite of her unhappiness at being told what to do — because toddler — I really love the ease of switching seat positions and the fact that I can have her facing me in situations when she gets overwhelmed by the environment. The only feature I really miss from the Omni stroller is the adjustable handle. My husband is quite a bit taller than I am, and my oldest daughter is shorter. 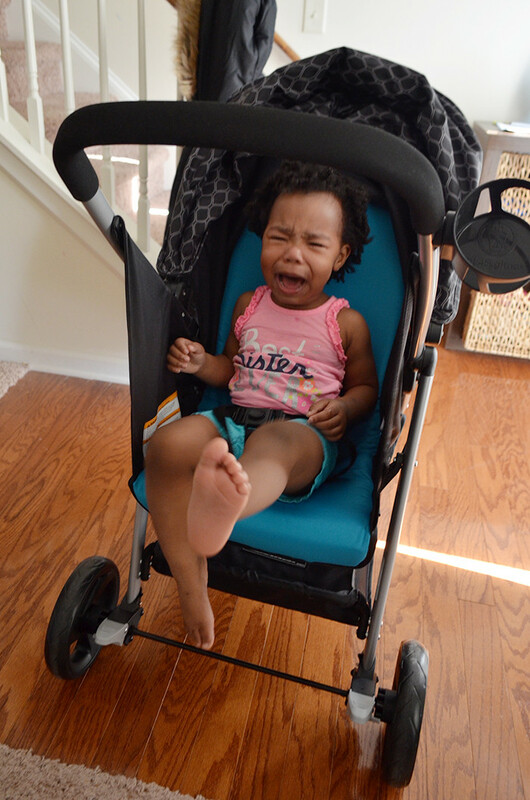 We really miss not being to adjust the stroller handle to a more comfortable position for our varying needs. 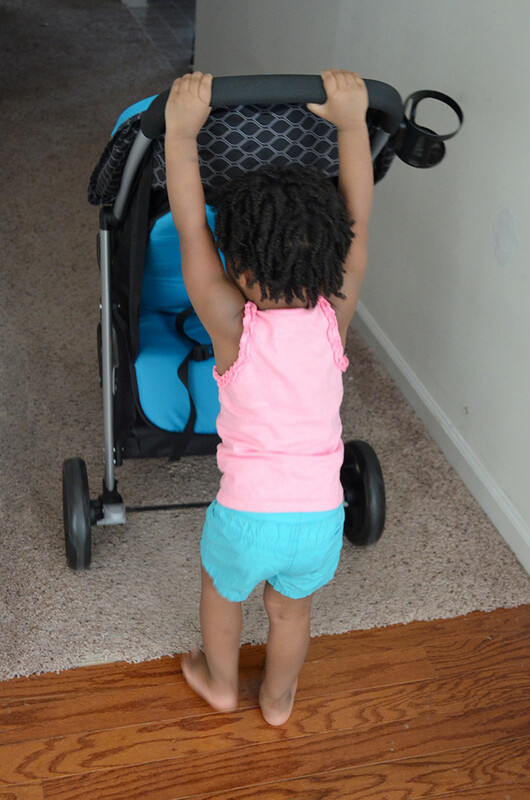 Juliza found the height perfect, though, since pushing is her favorite way to use a stroller. SMH. 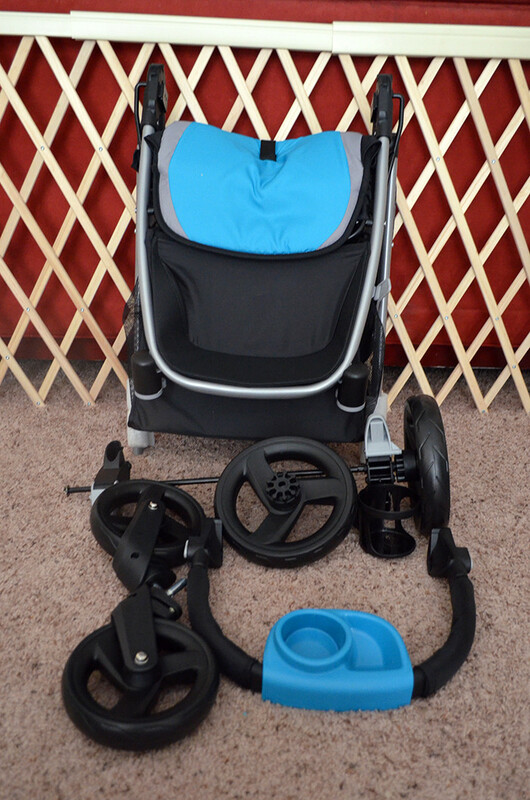 Overall, the stroller is really easy to open and collapse, offers a comfortable and smooth ride, and has a cupholder for Juliza AND for me. That last detail matters. Trust me. The rear-facing seat can also lay all the way back and convert to a bassinet for small babies who are sleeping. The bassinet feature of the Omni system came in really handy for us when Juliza would fall asleep while we were out and about, so I can vouch for the usefulness of this faeture. At $179, its an affordable travel system that offers great design, functionality and comfort. I’m really loving the Urbini aesthetic.